More than 3000 cytoplasmic, mitochondrial and nuclear proteins of metazoans are modified by O-linked beta-N-acetylglucosamine (O-GlcNAc). Since its discovery in the early 1980s, O-GlcNAc has been implicated in regulating molecular events that include protein folding and stability, degradation, activity, localization, and interactions. The cell coordinates these events with environmental and physiological cues to impact a host of cellular processes including signal transduction, metabolism, and the cell cycle, as well as transcriptional and translational programs. Deletion of the enzymes which add (OGT) and remove (O-GlcNAcase) is lethal, highlighting the importance of this simple sugar in regulating cellular homeostasis. 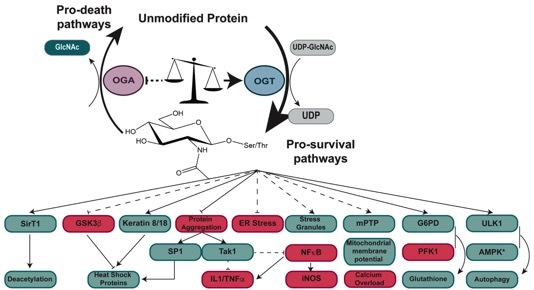 In 2004 we demonstrated that O-GlcNAcylation of intracellular proteins was a novel regulator of cell survival and a modulator of the cellular stress response. In response to diverse forms of cellular stress, the O-GlcNAc modification is increased on myriad proteins. Elevation of O-GlcNAc levels prior to or after the induction of injury promotes cell survival in models of heat stress, hypoxia, oxidative stress, ischemia repercussion injury, and trauma hemorrhage. Conversely, lowering O-GlcNAc levels sensitizes cells to various forms of injury. Together, these data suggest that modification of proteins by O-GlcNAc in an integral component of the cellular stress response. Elevation of O-GlcNAc levels modulates numerous pathways in a manner consistent with increased cell survival, including the expression of heat shock proteins. However, the molecular mechanisms by which O-GlcNAc promotes cell survival are unknown. Our laboratories goal is to understand the O-GlcNAc regulated stress response, how this can be manipulated to improve patient outcome, and how this response is misregulated in disease. Above: Biosynthesis of O-GlcNAc and Impact on Cellular Pathways associated with survival. Congratulation to Marissa Martinez Ph.D. - who has been recruited to Foghorn Therapeutics to study changes in protein complexes in cancer. 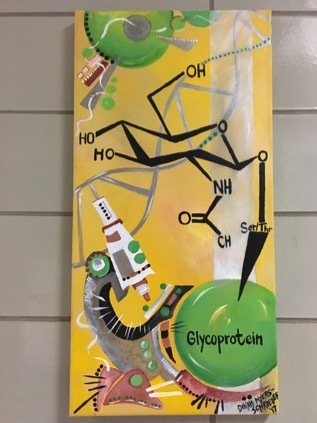 We are located in the Department of Biological Chemistry, at the Johns Hopkins University School of Medicine.